I’ve done them for years and years. Before it was called DIY, and before DIY was a blogging niche, and before it was the ‘in’ thing to do! Today I get to share with you a #BestofDIY project – along with 24 other bloggers – we’ve teamed up to bring you our best and to link together so you can click through to see them all. I stewed a bit about what to do for my project. Teaming up with such talented and wonderful bloggers it had to be something really great. I settled on one idea and then another, and ended up tossing them all aside. And then my eyes lit upon this chair I’ve used for a sewing chair. I got it at an auction last spring for a buck. Yeah. $1. It’s sturdy and comfy and I planned to give it a makeover, but it kept getting put on the back burner and I kept using it. It wasn’t terrible, but the fabric was stained and it didn’t have any ‘WOW’ factor. My hubby did an easy fix on that for me before I started using it at my sewing machine. 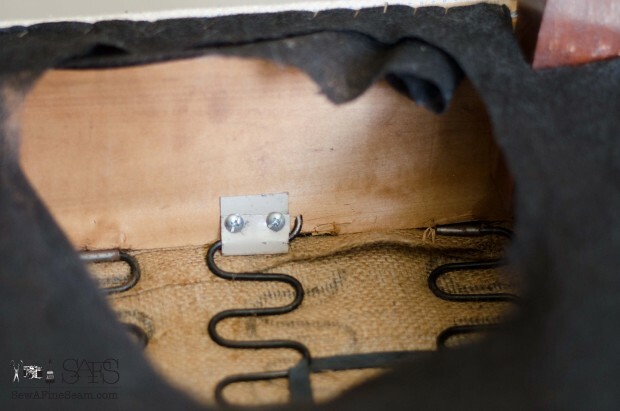 He wrapped a piece of metal around the spring and screwed it to the wood base of the chair. 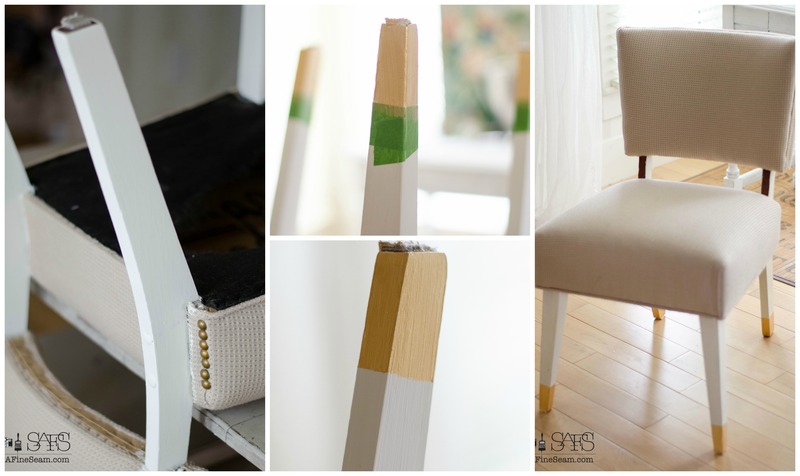 The first thing this chair needed was some paint on those legs. I pulled out some leftover Chalk Paint from the back of my stash and gave the legs a couple of coats. When the white was dry I taped off the bottom few inches of the legs and added some gold. Now to cover that old fabric and really up that WoW factor! 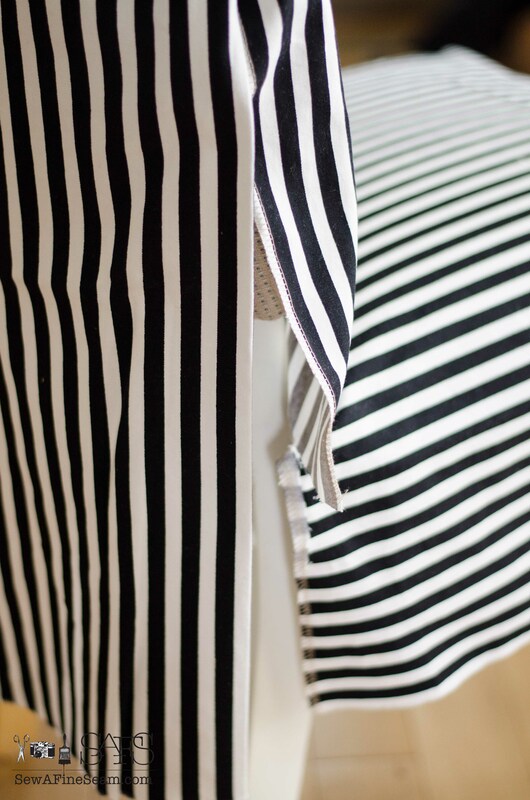 I’ve had this black and white stripe fabric in my stash for a couple of years. It was in the ‘as-is’ section at IKEA. It had been used in one of their displays as a curtain. There were 3 yards or more of the fabric and it was priced at $5. Of course I had to add it to my stash! To begin – I draped the chair and cut two pieces that would cover the seat, and the back of the chair. The back piece you can see is longer in the back to completely cover the seat too. Slipcovering symmetrical pieces is super easy. 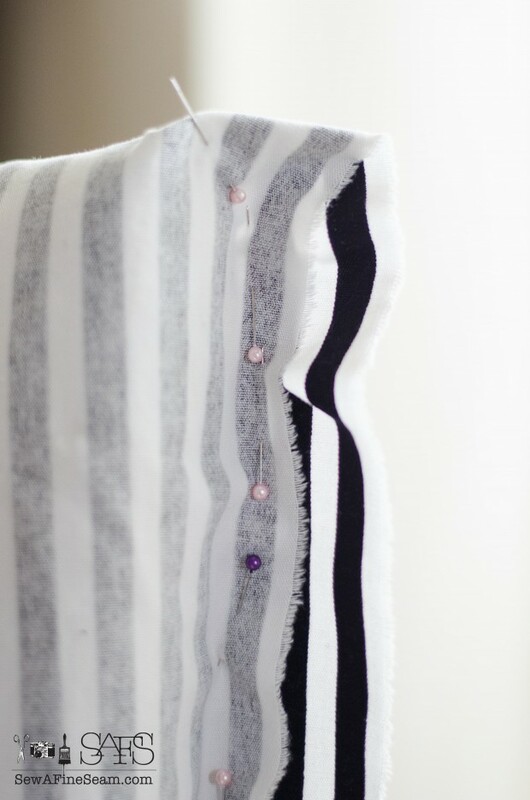 You turn your fabric right side down so you can pin it exactly like it needs to be sewn and then sew along your pinned line. I pinned both front corners of the seat so it would be a fitted piece. I also pinned the back to the seat along the seat line. I sewed along my pinned lines, removing the pins as I went. After sewing the extra at the corners was trimmed off and the seams all serged. I always put my slip cover on the right way after each thing I stitch to make sure it’s fitting like I want it too. Once I’m satisfied with that step I flip it over so the wrong side is up again. Next I pinned along the top sides of the chair back. Since the chair back is smaller at the bottom than the top I was only able to sew it from the top down about 7 inches. Sewing all the way to the bottom would not allow the back cover to come off and on. I stitched right along this pinned line. Now I had a cover that fit the seat and the top of the back snugly. The edges of the pieces left open I then serged to finish them and keep them from fraying. Both pieces were pressed neatly. The fabric to the front of the chair I pleated to bring it to the same line as the seat piece and stitched it in place. The back piece was pressed so it had a nice 1 inch hem to it and brought forward to cover the front piece. You can see in the bottom photo above that I then marked with a pin a spot on both pieces. This is where I would sew on my ribbon pieces that would tie to keep the slipcover on and make it fitted. I also did the same thing at a spot above and below this one. The placement of these you need to decide with each piece – I eyeballed what I thought looked good for the first side and then measured so I could make the second side match. I used ribbon I had on hand in my stash. I had enough of the gold for 4 of the 6 sets of ribbon so I used it on the top two on each side. You simply attach a piece of ribbon at each place you marked. I sew mine on by machine. There will be one piece of ribbon on each piece of fabric at each spot you want to tie the cover together. Once tied your cover is securely in place and the ties add to that WoW factor! 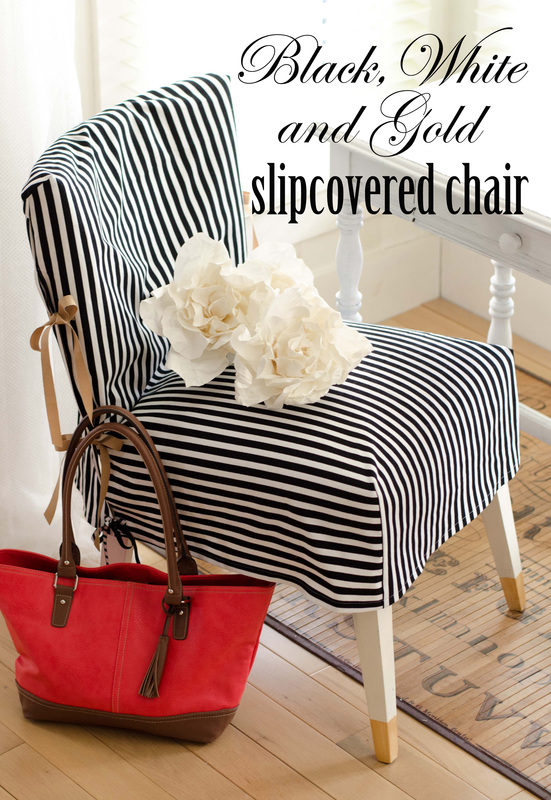 I’m loving the black and white stripes with the addition of the gold dipped legs and the gold ribbon. So what do you think? Do you like the black, white, and gold? Now go check out all the other great projects this group has put together! Amazing and inspiring – and it’s SPRINGtime! Time to get going on all the fun DIY projects we’ve put off for the winter! Follow along with me here to keep up with everything that happens around here! Wow, Jill, you really breathed new life into that chair! 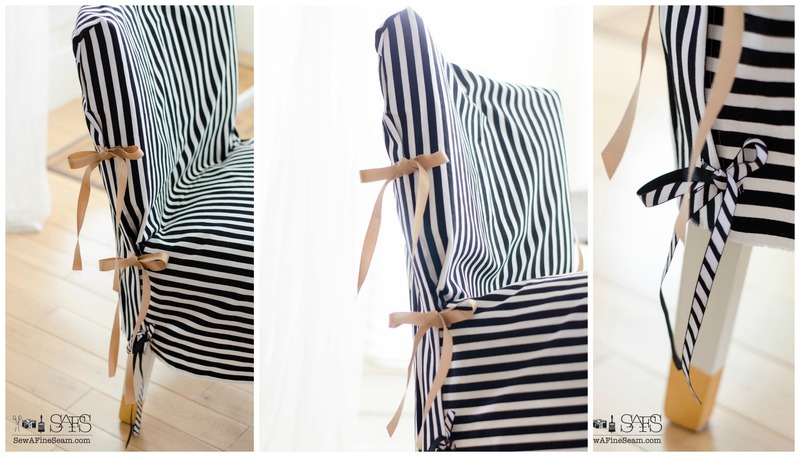 The stripes are so cute and the way you made the slipcover is just perfect for that little chair. 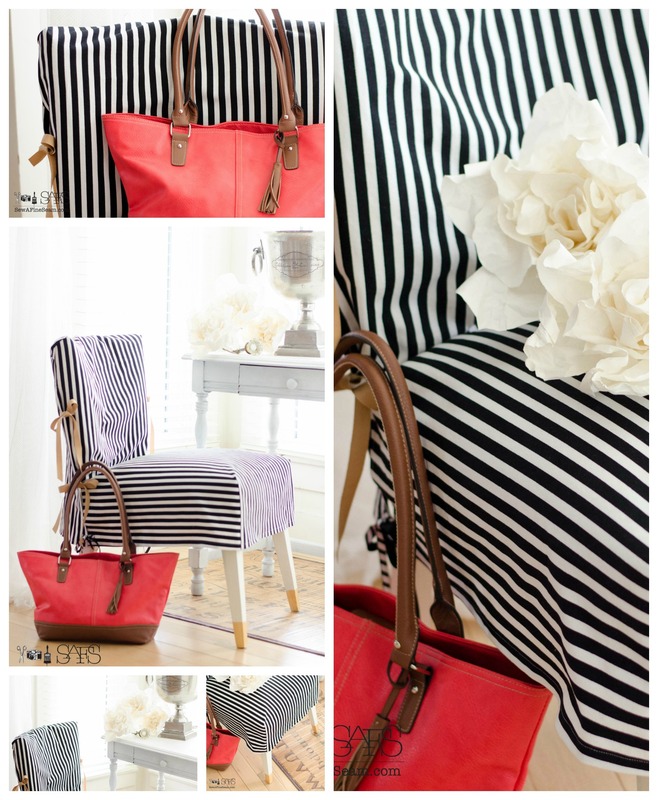 Thanks Carol – I love the stripes for this chair so much! Hi Jill! This is my first time to your creative blog! Wow! That chair transformation is amazing! I am a big fan of black and white… and a little bling! LOVE the stripes and the way you put together the slipcover! Great job! Thanks so much Yvonne! This was a super fun project! 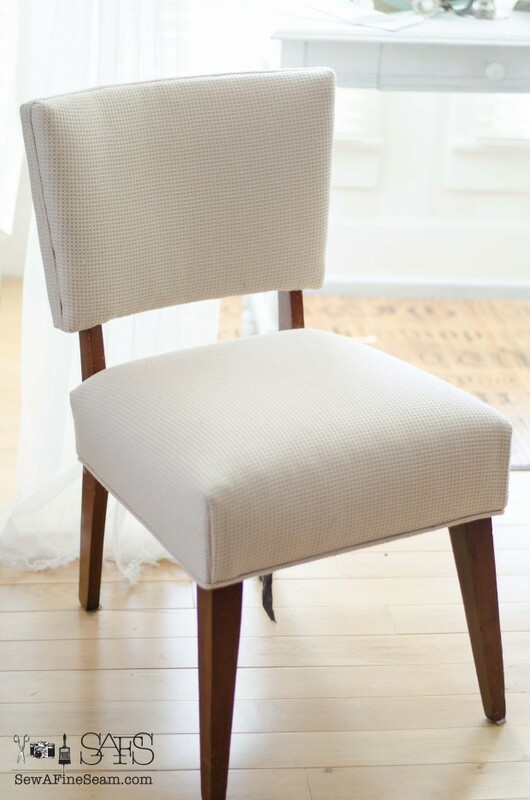 You turned this chair into a real charmer. 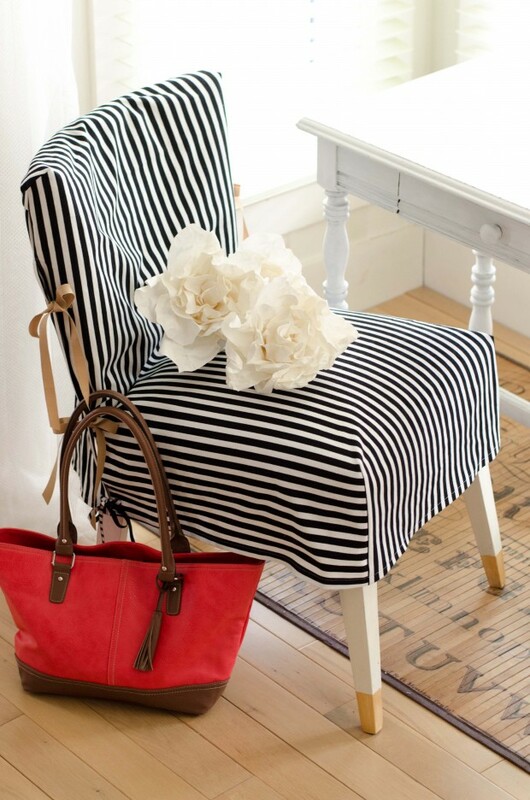 The black and white looks terrific and gives this chair a totally new look. Thank you Paula, I had so much fun creating this! What a beautiful “new” chair! I love the black and white stripes with a touch of gold. Thanks so much for sharing on the BEST of DIY. Thank you Meegan! Being part of this #BestofDIY has been so fun! What a fabulous transformation! Love the color combination… and what a steal for 1.00! Thanks Anne – I love that it was only $1 and that I had all the other stuff on hand! Thanks for this, Jill. I think I’ll do this on the chair in our guest room. Oh I hope you do KAren – it’s so easy and it makes such a great makeover! Thank you Christy! This piece will most likely be put up for sale at my Spring event – but I’m having a bit of trouble letting it go! Wow Jill, the black, white and gold really ramps up the wow factor on this project. I love that the chair cost you just $1… and look at her now!! Another fabulous #BestofDIY project. Happy sewing. Isn’t it so fun to take a super cheap piece that doesn’t look like anything spectacular and turn it into a ‘WoW’ piece! You gave this chair new life, Jill. Great job!! …and I loved your use of “buck” (GO BUCKS!). I have really been wanting to do a slip cover for a chair. You make it look so easy. Thanks for the inspiration! It is lovely! It really is easy Christy! I hope you go for it with your project and if you have any questions during your stitching please give me a holler! Thanks Lisa! I was super excited with the way this turned out! I can see all kinds of possibilities with this idea! 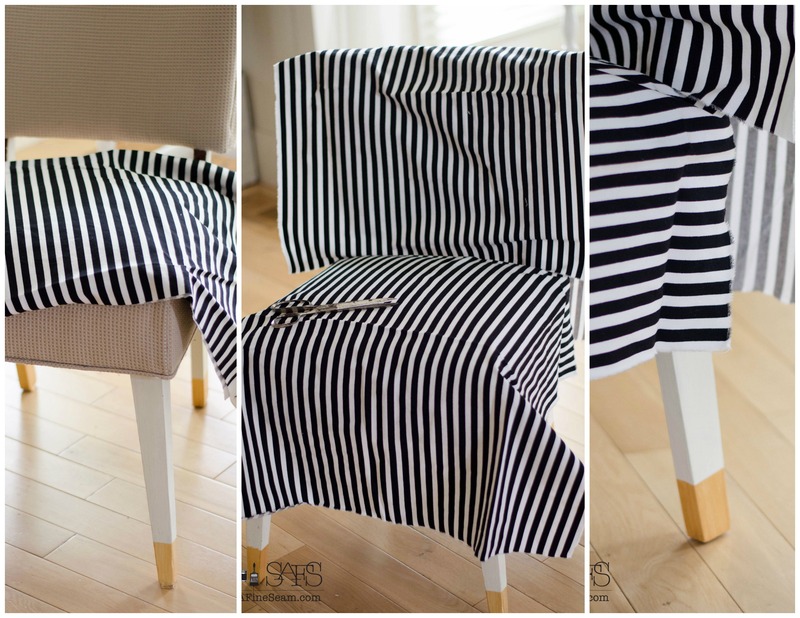 Thank you for showing us how you did it, as a tutorial such as a chair cover, would not work for every chair! I loved seeing how you laid out the fabric, and then pinned and sewed, making it possible to transform any chair with this method. I love it! Thanks for the inspiration! Yes! 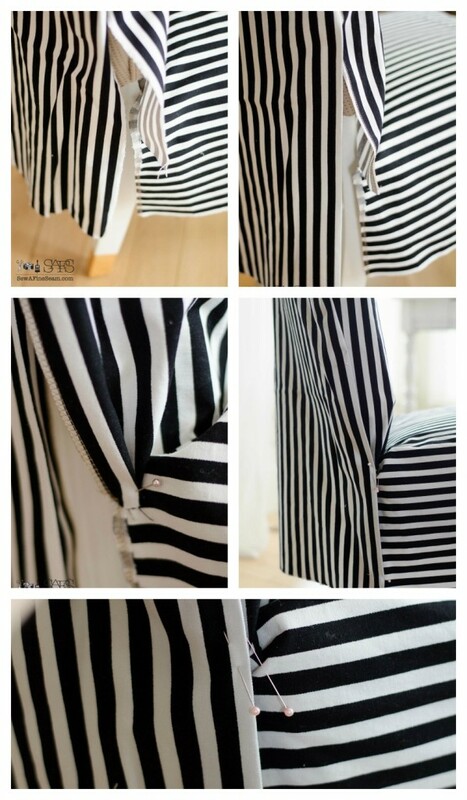 This method works for any symmetrical piece of furniture and is the easiest way to do it! You can even hand bast the seams if you don’t want to mess with the pins during sewing. 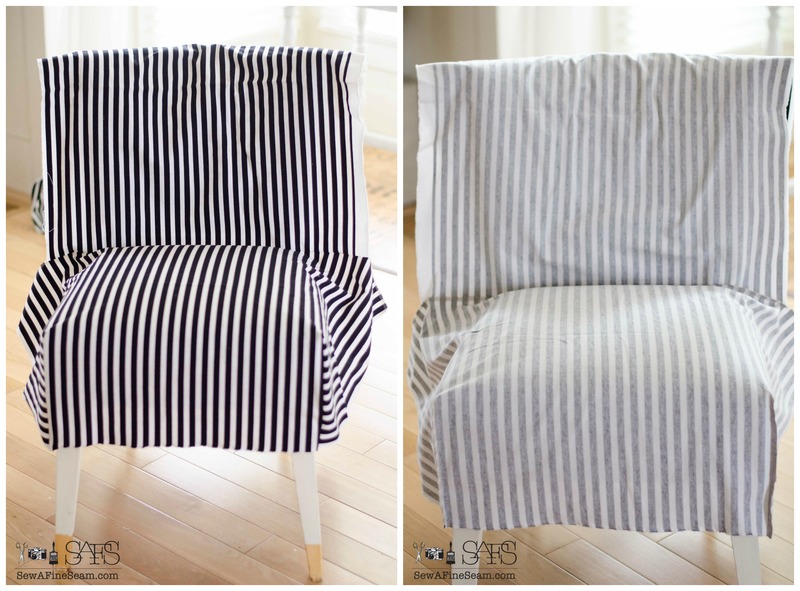 It’s really so much easier to make slipcovers than it looks like when you look at a finished one! So pretty Jill! Those gold dipped legs….LOVE! Great job! I love the gold dipped legs too Nancy! It somehow just went with the black and white and made it all come together! What a wonderful transformation! You make it look so easy although I’m sure it must have been difficult getting the stripes straight. Great job and I love the gold feet. Thank you Betsy! The stripes weren’t as tricky as I thought they might be actually! This whole project went really well! It’s really not as hard as it looks Jeanette! The first time making a slipcover can be a bit intimidating but then all of a sudden it comes together and it makes sense and it works and it’s this euphoric ‘ah-ha’ moment! Yes! 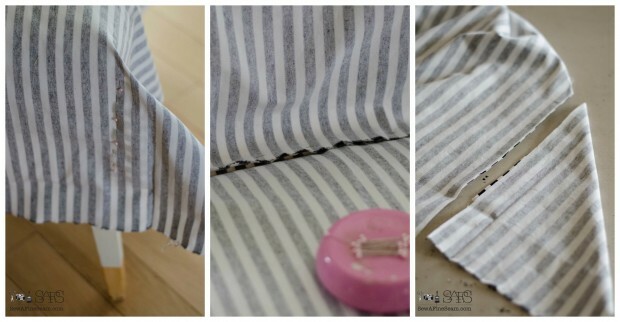 You should be able to get that wingback slipcovered using this method! 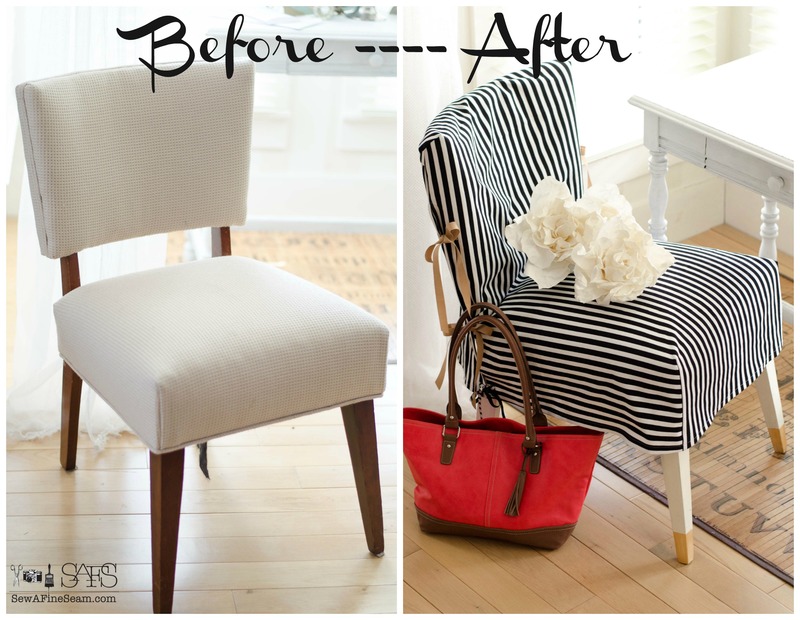 This is how I slipcover everything – even couches!